Hi, I would greatly appreciate some assistance with this parking issue. Apologies that this is a bit long – have tried to summarise it. I live in a cul-de-sac (close) and until a few years ago the local authority tried to CPZ the close but found that it was private land belonging to my housing association. It is a small close with bays that residents park in. 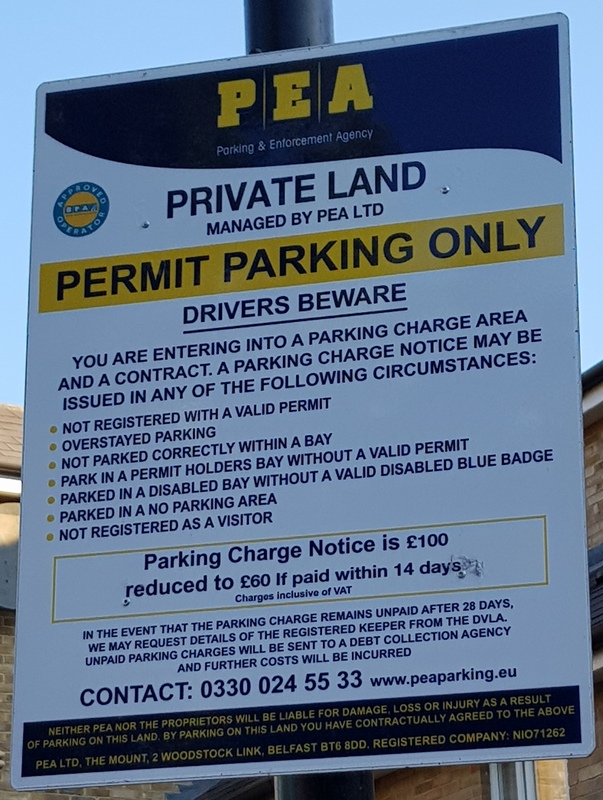 The local authority persuaded my housing association to get a private parking contractor which caused an almighty confusion between the residents and the housing association. To cut a long story short, PEA Parking got the contract. Signs were erected and one letter sent out about registering with PEA for a virtual permit. The housing association then stated that they would not get involved in any disputes with parking and disowned themselves from the matter. At that time, my son had a blue badge and I was given a mobile permit that I could put in my windscreen when parked. My car broke down on the close and I purchase another second hand one and informed the local housing office of the events of then I would be disposing of the old car. The then housing officer emailed PEA and c.c'd me into the email. Around the end of 2016 my housing association informed us of a consultation of merging with another housing association and this would be on-going for a while. Unbeknownst to us, the local office closed down as staff was restructured, no phones were answered for months - office telephone numbers were changed and all we were getting were mail shots about the merger continuing. - I had left my car outside my door for months when on leave and saw no parking contractor - let alone not being able to get through to head office to query where the new local office was. On 15 May 2018, I had a medical appointment for a minor op. I returned home and to my surprise and horror found a Parking Charge Notice on my windscreen. I was shocked as they had not patrolled the close for over 1 year and even the neighbours were sure they were no longer the contractors and felt that when a new one got the contract, we would be informed. 1. The Notice mentions the old housing association's (landlord) name which no longer exists. 2. My letter from my housing association dated 15 January 2018 re 'Change of Landlord' the old landlord ceased to exist on the 2 January 2018. 3. Letter confirming that I pay service charges for the maintenance of the car park so can park in the bay. 4. Their Notice is difficult to read as dyslexic and font is very small. – do not assume it has been cancelled. I had to contact the British Parking Association who stated that I should have had a decision within 36 days and they would contact them. I emailed PEA on the 12 July 2018 for a decision/POPLA reference number. -	No displaying a valid permit and warning signs etc. -	My old landlord still exists as the rebranding with the new landlord has not yet been completed. The parking restriction times were between 10.00am – 2.00pm Monday to Friday. There has been no written confirmation from PEA or the new landlord to confirm that they will continue to have the contract nor had I been contacted on the expiry of my son’s disabled mobile permit to change it to the virtual permit. Where do I stand? Any information appreciated. Thank you for your reply dk100uk, will read up post in link. Also curious, as I pay service charges for the maintenance of the car park to my landlord, do I not also have a contract to be able to park outside my house? you have supremacy of contract ..end of. PEA is a new name to me, are they based in Belfast? you need to consider what your tenancy says about the matter and whether you had ALLOCATED parking before the parking abndits were employed. Seeing the signage will help us help you as well, post up pictures. I wouldnt bother trying to reason with either the HA or the parking co, they dont have brains to fall back on when their inbuilt stupidity fails them. I had already tried contacting the HA and still waiting for various departments to call me back - nothing on their website either. See pictures attached - no times are mentioned on notices either. What is 'Supremacy of Contract'? Can I use this? Shame you've already appealed. I'd be interested in hearing their grounds for requesting keeper information beyond a single letter saying "Pretty please, tell us who the driver was... Oh, go on... Pleeeeeease". As for "Supremacy of contract". What does your HA Tenancy agreement have to say about parking at the property? Forget what your landlord is called this week for now. What was written in to the tenancy agreement that you've signed is the important bit. If the Parking Cowboy came in after your tenancy commenced there is an almost certain supremacy of contract that they cannot override in your favour. that is one of the reasons I said dont bother. Supremacy of contract is when you have an agreement such as a lease or tenancy that states you are entitled to use a particular allocated space. Once that is there then neither the landlord nor a crappy parking co can unilaterally change that so your lease/tenancy trumps whatever they say is in force for the rest of the common access land. 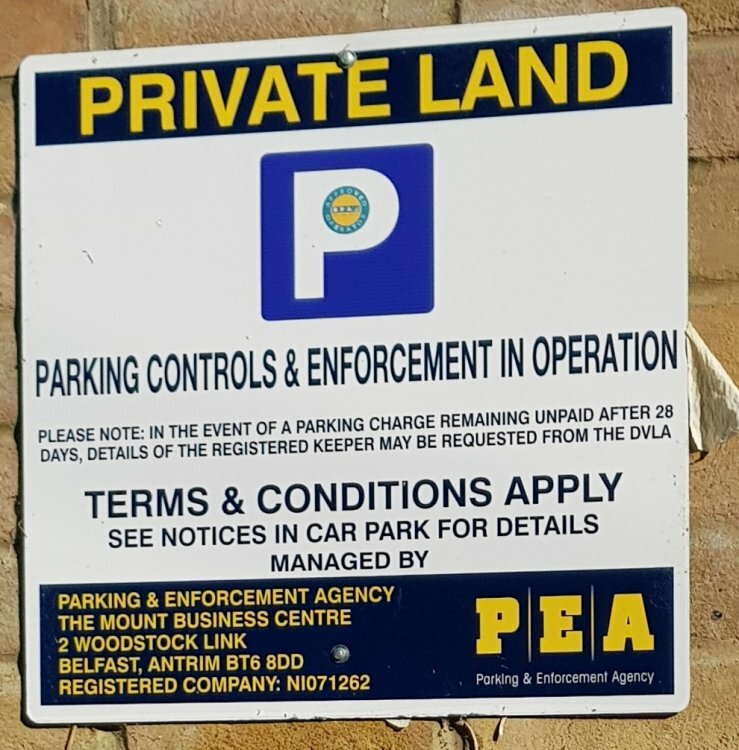 The idea of permits is an administrative convenience so the parking noddys can see at a glance that the vehicle is allowed to be there. It is not for them to decide how you park either in your space or eve in your neighbours sopace, this isnt the common parts they are supposed to watch over but they will always try anything to chisel extra money out of anyone and dont care that they are wrong as you cant remove them form the site. You can howver do them for trespassing on to your space to ticket your vehicle so once you know that your space is yours only then you can set about winding them up by not displaying your permit, allowing your frieds to aprk there and so on. they will spend money chasing you for no reward. (i) Not to block local roadways, and other vehicular access, and to keep them, and car parking spaces clear of unroadworthy and unlicensed vehicles and other obstructions. When everyone first moved into the development, the development project manager told all the residents that we had been allocated a bay each but the numbers were never painted on them as they ran out of money and made us move in a week earlier so as not to pay for site security for an extra week. Thanks again, much appreciated. I have to put my appeal into Popla this week. - they havent changed your tenancy, just bunged a few signs up and told people to get a permit and that isnt the same thing at all. In short, you do have superiority of contract and without chucking you out of your home they cant do anything that would make a difference. Hi, still trying to put my appeal together for POPLA and found a PSC07 filed by PEA Parking on Companies House stating that Nationwide Controlled Parking Systems Ltd ceased to be a person with significant control in December 2016. Does this mean that PEA was running 2 companies at the same time and could use both names. Some of their annual returns name Nationwide Controlled Parking Systems Ltd holding 1 Ordinary Share Capital. Does this make them the actual 'owner' of the company? If so, what name should they be using when they tender for contracts? They also have a registered address in the UK, do they now come under UK law as they have registered with Companies House to be able to operate in the UK under UK law? I have uploaded the PSC07. As far as civil law goes, I'm fairly sure it's pretty consistent throughout the UK, with a few minor "tweaks" for the Scots I don't think that civil law in the North of Ireland is that much different to the mainland. So yes, they would be operating under UK civil justice laws & rules. What they most certainly don't have is the POFA, so again, it's a shame that you've appealed this and more or less confirmed that you were the driver as there was no way that they could have come after you as the keeper. Go down the supremacy of contract route with POPLOL and as soon as PEA see your appeal, they're likely to fold as they're well aware of what will happen further down the line if they don't. Hi, an update on my POPLA appeal. PEA have uploaded 3 documents as evidence. One document was full of pictures of my car and their signs. They have produced a contract commencing in 2013 but it is in the name of my current landlord who did not exist until this year. They have also stated that I have breached their contract not to have displayed a permit as their sign instructs. How do I proceed with regard to the contract as I do not believe that this contract was always in place as they were not seen for over 1 year? Any info will be helpful as I have 7 days to respond to POPLA. and you expected anything less? Thanks for your quick reply but I still need to reply to POPLA based on the their defence to having a contract with them. Hi, if I don't bring this to an end, how will not doing anything stop them from putting more PCNs on my car in the future as I live in the close? they arent worth a light and if they want to spend a small fortune for no reason that is up to them. You could get a restraining order if you really wnat to hurt them but not for 1 ticket! In the meantime get a permit for the new motor, and remind them that you still have Supremacy of Contract .